KYOKUSHIN (Way of the Ultimate Truth) is a Japanese style of karate incorporating many techniques taken from a number of old karate systems including Shotokan, Goju Ryu, Shaolin and Kempo. It is this combination of the best of many systems that produces a style that is both dynamic and popular. MASTER MASUTATSU OYAMA is the founder of the style, and was head of the world-wide Kyokushin-kai (school) till his untimely death in 1994. Sosai Oyama was born in Korea in 1923, and he travelled to Japan where he became a student of Gichin Funakoshi (who introduced karate to Japan), and in 1947 Sosai Oyama won the All-Japan Karate Championships. Following his success, he decided to devote his life to karate, and in 1948 he secluded himself in the mountains. During this time his training included standing under icy waterfalls, pounding at trees to toughen his hands, and weight training with huge boulders. Satisfied with the results of this vigorous training, Mas Oyama returned to civilisation. He astounded the karate world in 1950 with his barehanded battle with bulls, during which he dealt death to 3, and ripped the horns off many more. In 1956, Mas Oyama opened Kyokushinkai-Kan in Tokyo, and developed the style to include 10,000,000 students training in over 50 countries throughout the world. 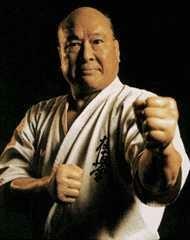 Sosai first came to Australia in 1977 for the Australian Full Contact Championships. Following the death of Sosai Oyama, administrative divisions arose in Japan and around the world. Consequently, a number of separate groups were formed, although each group strives to maintain the teachings and philosophies of Sosai Oyama. In 2003, the Japanese group the the Alpine Dojo is affiliated with changed their name to “Shinkyokushin”, literally meaning “New Kyokushin”. Our country representative is Shihan Peter Volke, 6th Dan, who is also a member of the International Grading Committee.